Office Depot, FedEx, and Staples are still the best examples of sustainable paper sourcing in the office supply business, according to ForestEthics’ annual Green Grades Report Card. All the players in the mass market retail sector have significant work to do, with Amazon still lagging in the back. And Unisource and United Stationers continue to dominate the wholesale/distributor sector. ForestEthics grades companies on a number of factors, including chain of custody (where does the paper come from? ), recycling, Forest Stewardship Council certification, and Sustainable Forestry Initiative greenwash (whether companies use SFI, a greenwashed certification created by the timber industry, as proof of sustainable sourcing). 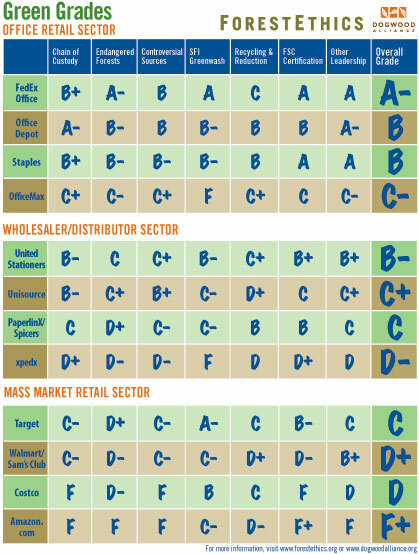 Even the most sustainable companies on the report card have work to do. FedEx and Office Depot, for example, still source some third-party paper from unsustainable plantations in the U.S. South. And Staples still recognizes the legitimacy of SFI in its paper policy. But companies in the office supply sector are still light years ahead of those in the mass market retail sector. Walmart sources paper from suppliers connected to endangered forest logging, and it actively touts the legitimacy of SFI. Amazon doesn’t have any sort of paper supply policy at all. But we’ll give companies in the mass market retail sector and wholesale/distributor sector the benefit of the doubt–ForestEthics just created those two categories last year. Over time, we’d like to think that these companies will think more critically about ForestEthics’ ratings, much like companies in the office supply sector have already done.